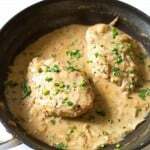 Creamy Mustard Chicken – chicken breasts smothered in a creamy dijon mustard and cream sauce. A quick and easy 1 skillet chicken dinner that is ready in 30 minutes! Who wants to take a guess on how much our electrical bill is going to be this month? This past week it has been close to 100 degrees for 4 days in a row. Thank goodness we have air conditioning. Otherwise, I would have spent a lot of time at the grocery store standing in front of the refrigerator section. July was lovely, and we barely had to turn on our AC. But we have been turning it on the second we walk in the door for a lot of August. And just this morning, I was awoken to Shawn swearing because he forgot to turn it off before going to bed. So our AC was running at 65 degrees all. night. long. Our electric bill is going to be at least double. With hot days like this, it is making me long for cool fall days. And I know fall is coming soon because every other commercial is for Back to School sales. Didn’t those commercials make you so depressed when you were a kid? Especially when they stared up in July? They shouldn’t start to show those until at least August 1st. This 1 skillet creamy mustard chicken is a great back to school meal. Only 1 skillet, so clean up is a breeze. And it’s ready in just 30 minutes! 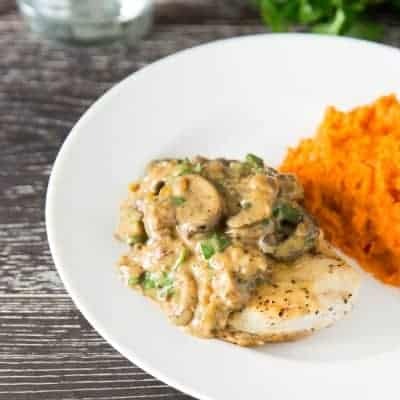 Chicken breasts that are covered in a delicious creamy dijon mustard sauce that everyone in your family will love. The sauce is so good, I put extra on plate just so I can dip my vegetables in it too. Preheat a large skillet over medium high heat. Season the chicken with salt and pepper. When the skillet is heated, add the olive oil, then cook the chicken about 8 minutes per side, until golden brown and the internal temperature reaches 165 degrees. Remove the chicken from the skillet and transfer to a plate, tent with aluminum foil to keep warm. Cook the onions in the same skillet as you cooked the chicken. There will still be some oil left in the skillet. If necessary, you can add a little more. Season with a pinch of salt and pepper. Cook for about 4 minutes, or until the onions soften and turn translucent. Add the garlic cloves, and cook just 30 seconds, until you can smell the garlic. Add the white wine (or chicken stock) and turn heat to high. Add the dijon mustard, and stir to combine. Cook until the sauce has reduced by half, will take about 5 minutes. Turn the heat to low, then add the heavy cream and butter. Whisk to combine. Add the chicken back to the skillet to warm thru. 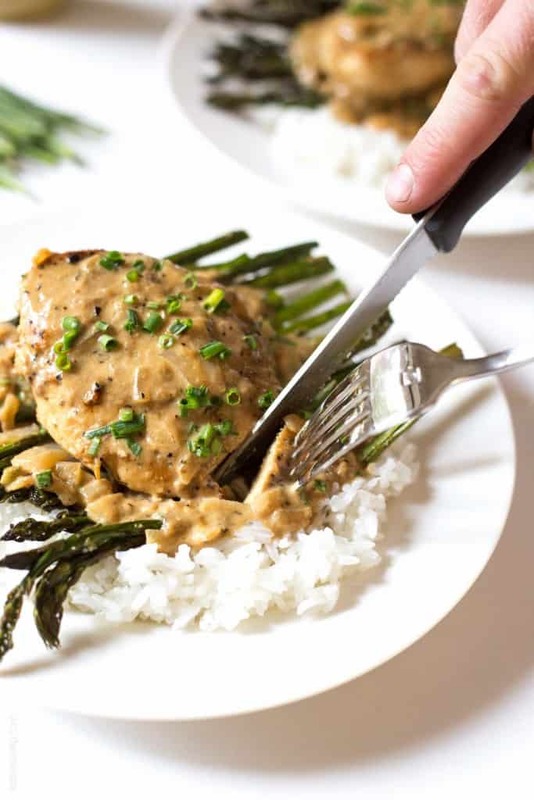 Serve the chicken warm, topped with the creamy dijon mustard sauce and chopped chives. Feel free to add more heavy cream if you like it creamier! And my mom loves this sauce sweet, so she adds in some brown sugar too. We’ve somehow managed to make it through our entire summer with no A/C! I will admit though that the past week has been kinda rough, since it was nearly triple digits! Bring on the fall weather fo’ sure. ;) And cozy, comforting, one-pot chicken dinners like this! Seriously diggin’ that gorgeous mustard sauce! Mmm looks delicious, Natalie! I love the sound of a mustard cream sauce. Sounds like the perfect dinner! Zurich has had the hottest summer since 2000, and there is no AC anywhere! When it gets hot, its hard to find places to cool down besides jumping in the lake. It changed this week though and now it feels like a rainy winter. such weird weather, but perfect for this chicken! yummy. I love mustard sauces. Natalie it’s been bad here too and our AC has been running like forever! But thankfully we have this creamy one pot mustard chicken to make us feel better!! That sauce though!! This looks so heavenly, Natalie. My mouth is totally watering over here. Yum! I hate those high electric bills….so annoying. This looks sooo creamy and delicious! The weather has cooled off beautifully here this week and I just LOVE IT! It’s warm during the day and cool at night and just has me itching for fall! It’s been so hot this week where we are too. Thank goodness for A/C and easy skillet meals like this. It looks so flavorful and delicious! Love the creamy mustard sauce! It’s been almost 90 here and soooo muggy! I feel you! Our electric bill is going to be high. 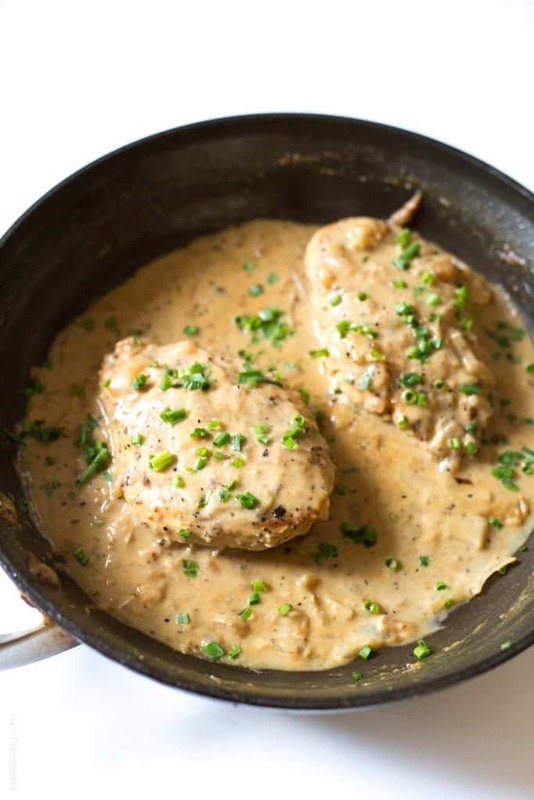 This chicken looks wonderful, love that creamy sauce! I don’t even want to see my electric bill after the past week — it’s gonna be really bad! Thank goodness it’s cooling off. This is one elegant dinner, Natalie, and I love that it’s still so easy, too. The sauce sounds incredible with the white wine, mustard, and just a bit of cream! Not to be dramatic or anything, but I would DIE without air conditioning. It’s been so hot and humid here that it’s hard to even breathe. I pretty much hide out in the AC all day. I cringe just thinking about this months electric bill! 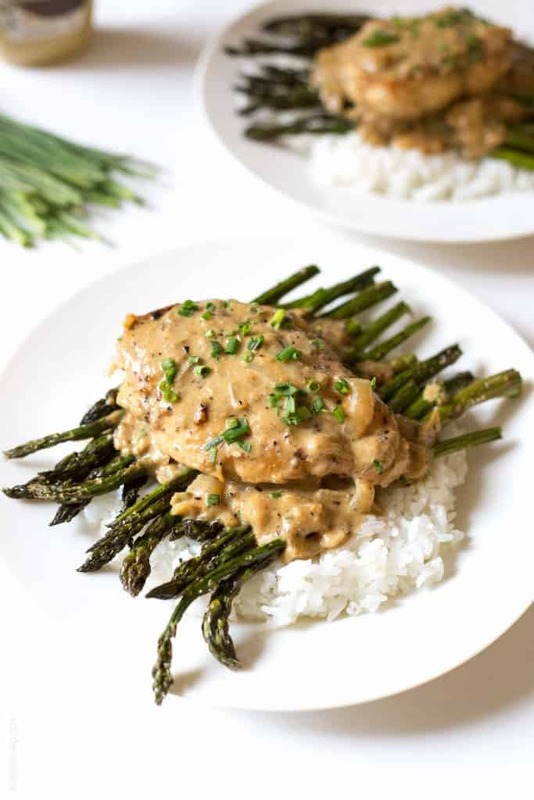 This creamy mustard chicken looks wonderful! I love creamy sauces so this is right up my alley! I feel your pain, it’s finally started to cool of here but it’s been close to 100 all summer! Air conditioning is such a life saver. I’m loving this chicken too, anything that’s quick and only requires one dish is perfect for me! Electricity can be crazy expensive! This chicken would make me feel better though! Plus I love how it’s done in just one skillet! This looks downright delish! You make the best lookin’ dinners! Wow! 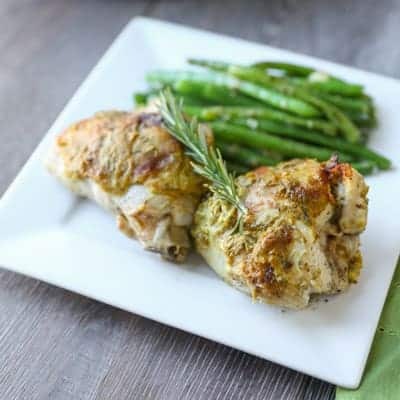 This mustard chicken sounds and looks absolutely heavenly! 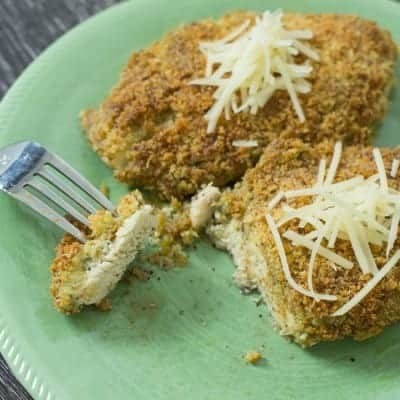 So quick, delicious and flavorful! Ugh, we pretty much HAVE to keep our AC on May through September, AT LEAST. So. Hot. So I’m really jealous you only have to kick it on here and there! This chicken looks so yummy. Definitely a perfect back-to-school meal. I love quick & easy meals! I’ve just come to terms with the fact that our AC bill is going to be huge in the summer and that it is totally worth it!! It is about 100 degrees here today and my car air conditioner broke and running errands was pretty brutal! I bought a cold drink at every store I went to! At least you were comfortable that night when you forgot to turn the air off! I’m glad it’s cooled off a bit this week, and despite the heat I’m not quite ready for fall yet. :) I love the dijon in this dish, and I’m always in need of more quick meal ideas! Question: at what point did you add the mustard? I read the recipe three times and didn’t catch it. :) thanks. This looks amazing! Which type of white wine did you use? Thank you! I used a chardonnay!